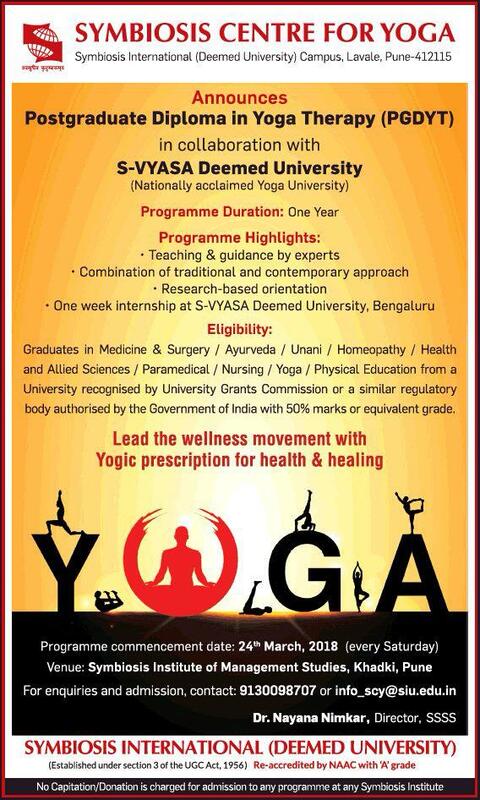 Symbiosis Centre for Yoga, Pune is introducing a new course – Postgraduate Diploma in Yoga Therapy (PGDYT). This course is exclusively for medical and alternative medical professionals which is very relevant from yogic perspective. In the field of therapy, positive and motivating results can be seen, if, a medical practitioner or alternative medical practitioners learn and experience yoga in depth and combine the knowledge into their profession. The first one was from Dr. H.R.Nagendra who is the Chancellor of S-VYASA. He mentioned that once he visited abroad to one of the best cancer hospitals and was surprised to see the advance technologies in the field of cancer treatment. During the meeting to the head of that hospital, he congratulated for the development and asked if there is any reduction in the cancer patients due to these advanced technologies. The head replied-“No, there is no reduction, rather it is increasing.” Then he asked about the reason of cancer and the head had no idea about the reason of cancer. Dr. Nagendra has conceptualized and described that the root cause of cancer is not in physical body but in the Manomaya Kosha (mental body) under Viparyaya which is called the state of wrong knowledge in which the enemy cells are considered as friendly cells. From his point of view, if we have to treat the cancer then through yogic practices, work on Viparyaya (wrong knowledge) i.e. the Manomaya Kosha is needed. The second one was a research work done with Meditation on Cancer. The researchers have found that the practices of Meditation and Chanting lowers down the NFkB within few months. NFkB is called the mastermind of inflammation and is inherent in each cancer cell. So likewise, there are many other important perspectives to yoga which are very relevant in the therapy. The objective of this course is planned in a systematic way to cover the yogic perspective of therapy as well as philosophy, so that, the participants can develop the understanding of Yogic Health Management in depth and lead the wellness movement with yogic prescription for health & healing. The course commences on 24th March’2018. Time: – 7.00 am – 1.00 pm.